In the end times, a Silent enemy will arise, and in its wake it shall bring oblivion. This the Gods of Man have seen, and this the Other has told to the Goddess Belisards. Guided by the vision of Larissa, Oracle of the Gods, the Gods of Man commanded their vassals, the noble Vlainor, to infuse the favoured bloodlines of humanity with the very power of divinity The peculiar magic of divine beings is called Psionics, and so armed the children of men shall arise to defend Arcanis for defeat brings with it the end of all things. Whereas weilders of magic rely upon careful ritual and the fundamental properties of matter to work their miracles and tricks, a Psion commands the very power of creation through sheer force of will. No obstable can withstand the focused power of thought from a gifted and trained mind. Within this stout volume, the secrets of Psionics are laid bare for all to see. Honed by five years of rigorous play testing in the Living Arcanis campaign, one of the world's largest interactive roleplaying environments, Psionics Unbound refines the Psionics rules for Third Edition Fantasy Roleplaying. Psionics Unbound is a complete rulebook, no other Psionics rules are required for use in any campaign, Arcanis or otherwise. 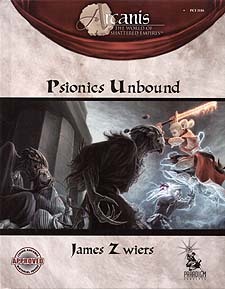 Psionics Unbound is designed for use with the Revised Third Edition rules of the world's most popular fantasy roleplaying game! You may also want to get your hands on the Codex Arcanis and Player's Guide to Arcanis to join the thousands of people world wide who have already discovered the excitement of Living Arcanis!